This procedure is configured for a rope under tension, at specified angle leading off & instantaneous position across the drum. The rope is wound on the drum. The drum may rotate on two bearings, one at each end of the drum. The rotation, pulling the rope in or allowing it to pay-out under the control of motors & brakes. The drum, motors & brakes are then held by the base frame. The base frame is secured to supporting structure by four fixings (on rectangular disposition). 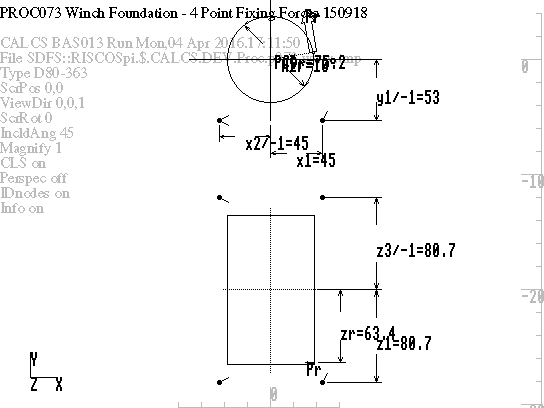 The object of the proc edure is to obtain the forces acting in these four fixings. THEORETICAL BASIS: Statics analysis from 1st principles with reasonable simplifying assumptions to render the problem statically determinate. As the origin of the co-ordinate system is at the centre of the drum, the position of the base frame fixings (1 to 4) will normally be below the drum axis and will be entered with -ve values of y1. Where the base frame sits horizontally, y co-ordintes are vertical. For the case where the base frame is fixed to a vertical surface, x co-ordintes are then vertical. Note that zt needs to be specified according to the relative effectivity of motors/brakes at each end of the drum. For example, if motors contribute equally at each side of the drum, then zd1=0. Ifa motor acts at one side only, then zd1 will equal th e transverse offset of the motor effective driving point. The formulae of the calculations are self-explanatory. Note that results are provided for three instantaneous positions of the rope across the drum: -zd1, 0 +zd1. This provides a range of loadings on the fixings. L06_D$="MH Rope Dyn Force Li0041"